How often we hear this In Indian media and by Indian leaders that India is a secular and Democratic country where everyone is having freedom. I would call it one of the biggest lie of our times. India is not secular and Democratic and i will prove it in my post. one hundred thousand Kashmiris are killed In Indian army state terrorism in last two decades. Thousands are missing. India is rejecting Kashmiris democratic right to choose with which country they want to live by not acting upon UN Resolution of 1948 which was accepted by Indian rulers that time. In 1984 Sikhs most holy place Golden temple was destroyed and thousands of Sikhs where killed by Indian army. In 1992 Babri Masjid was destroyed and thousands of Muslims where killed by Hindu extremist parties who later on won the elections in India. in 2002 more than 4 thousand Muslims where killed in Gujrat by Hindu terrorist groups. Hundreds of women where raped. 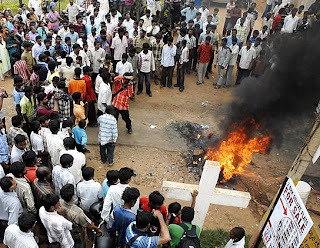 in 2006 Hundreds of Christians where killed in State Orissa while many churches where destroyed by Hindu extremists. In India's largest city Mumbai many small cases of riots against Muslims keeps on taking place. there are many areas in Mumbai where even secular Muslims can't buy houses. There are hundreds of Anti Muslim groups in India like Shiv Sena, RSS, Bajrang Dal. Muslims are Discriminated in every field of life except showbiz and Cricket. If you still think that India is a Secular and democratic country then i am sorry to say that you are on mistake.